ASIA NEWS REPORT: An armed man opened fire at a Christian-run liquor store in Giza, killing two people. ISIS claimed responsibility for the attack on the church of Mar Mina in Helwan. Solidarity between Christians and Muslims against terrorism is growing. Fr. Rafic: The attacks are an "intimidating message" to the government and president for their tolerance towards Christians. Cairo (AsiaNews) - More Christian blood has been spilled in Egypt. In the land of the pharaohs, the new year began with the murder of two orthodox Coptic brothers who were inside a liquor store in al-Omraneya, Giza a district west of Cairo, stormed by a man armed and masked on the night between December 31st and January 1st. The attack comes a few days after the raid that struck a Coptic church and another alcohol store run by a Christian on the southern outskirts of Cairo. Pope Francis himself at the Angelus on December 31 expressed his closeness to the Coptic Orthodox community of Egypt; the pontiff prayed for the victims and that "the Lord convert the hearts of the violent". Local sources report that a masked man, armed with a rifle, opened fire from outside the building. The bullets hit and killed two Christian brothers, friends of the owner, with whom they had been celebrating the New Year. After striking, the assailant got back on his motor bike and fled the scene. The attack has not yet been claimed and it is unclear whether the attacker targeted the shop because it sells alcohol – which is legal in Egypt, but only with appropriate licenses - or because the owner was Coptic. Meanwhile, photos of the blood covered corpse of one of the victims, are circulating on social media. Contacted by AsiaNews Fr. Rafic Greiche, spokesman for the Egyptian Catholic Church, speaks of "targeted attacks" by extremists that are on an "increase". The priest adds, however, that "it is not a question of groups or organizations like Daesh [an acronym for the IS]", which would strike with "more men or to carry out more major massacres". He speaks rather of "single assailants", of lone wolves who "have been brainwashed" and target Christians "considering them unfaithful". "We can be attacked and this can happen at any time," says Fr. Rafic, especially "in the poorest areas". "These attacks - he concludes - more than a threat to Christians represent an intimidating message to the government and to President al-Sisi, guilty of helping Christians by encouraging the construction of new churches or by promoting a policy of greater tolerance. Today the president has granted citizenship to our patriarch, obtained in less than three weeks compared to the necessary two years ". In a nation of almost 95 million people with a large Muslim majority, Coptic Christians are a substantial minority of around 10 per cent of the population. Last year the country aw a series of bloody attacks, some involving Christians. The escalation of violence almost led to the cancellation of Pope Francis’s apostolic journey to Egypt last April. However, the pontiff was able to visit the country where he met with its president and the great imam of al-Azhar and celebrated Mass before tens of thousands of people. 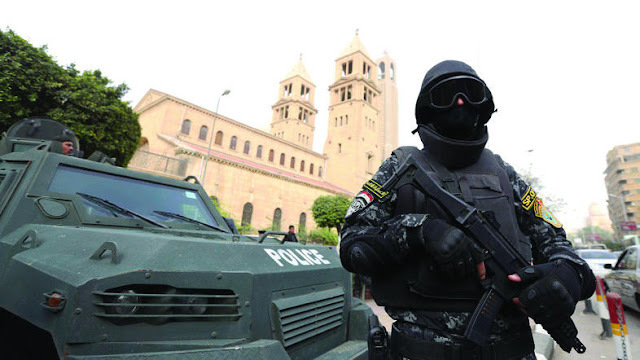 On December 29, terrorists struck the Coptic church of Mar Mina, in Helwan, a suburb south of Cairo. At least 10 people died in the attack launched by two armed terrorists, about twenty were wounded. The celebrations for Catholic Christmas were held regularly; now the focus is on the Coptic rites, which celebrate the birth of Jesus on January 7th and the danger of attacks or violence is high. Meanwhile, new details emerge about the assault on the Coptic church at the end of the year, claimed by the Islamic State (IS, ex Isis). According to local witnesses, it would have been residents and faithful, and not the police, to prevent the toll of the attack from being even higher. In particular, a 53-year-old man living in the area managed to block one of the two assailants while he was reloading his automatic rifle, saving the lives of dozens of people; others threw stones at the second fleeing assailant.